Tussock Traverse this weekend and the weather is looking FINE! Whether competing, spectating or marshaling, the Tussock Traverse is sure to be a great day out for everyone in Tongariro National Park. Heres a picture of the happy crew who spent Tuesday morning this week preparing the 750 tussocks for the event. A group of about 20 kayakers, aged from 10 up, set off on January 5 from Motuoapa to paddle into Waimarino Wetlands. After crossing the southern end of Motuoapa Bay we entered the wetland through a narrow channel, through which a strong current was flowing into Lake Taupo. Entering the wetland was like entering another world. Most of us were surprised by how beautiful, serene and peaceful it was. Other surprises included the large areas of open water, the floating islands of vegetation complete with their own plant communities and the thin parallel bands of vegetation running through the wetland. I later found out these mark where ridges are formed from storm-driven waves off the lake and the Waimarino River transporting sediment. The trip was ably guided by Nick Singers and Harvey Steeds from the Department of Conservation, with kayaking expertise provided by Andrew of Tongariro River Rafting. Most of the vegetation around the viaduct was removed by a very enthusiastic crew at the clean up weekend last month. There is just half a day’s work left to do. After completion, anyone interested could wander around and check out some of the Old Coach Road not in use now. NOTE: Sunday 29 January is the day after the Tussock Traverse so if this event is delayed by a day due to the weather, the Taonui project will be moved to Monday 30 January. For enquiries or to join in on this volunteer activity, contact Frank on 09 620 6650 or fkatavich@xtra.co.nz. As they say, "The mail must get through" so on Saturday morning we checked the traps at Rotopounamu and went right round the lake, hence the wet feet! Good work guys. Thanks to Kevin Griffiths for the snaps! Here are the results from the latest tracking tunnel round at Rotopounamu. Nathaniel has processed the cards and entered the data and the results are once again great!! The contractors have completely replaced all of the bait in the bait stations with fresh stuff and this will be left in place until the end of February. Thanks again to all of the people who ran the lines. 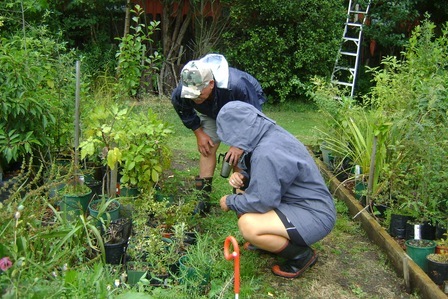 Native plant enthusiast, local Turangi resident and owner of Tui Lodge, Ian Jenkins, recently donated the native plants he has nurtured from seedlings to the Project Tongariro Nursery. Thanks Ian, your donation is greatly appreciated. Upcoming Field Trips: a great response so far! Project Tongariro has some great field trips planned for 2012 and there has been a lot of interest in them since the last newsletter...there are still a few spots available on these trips so make sure you register your interest asap so you don't miss out. This is one of the North Island's best mountain bike rides and the adventure includes a jet boat ride. Project Tongariro is going to make a weekend of it. Email Mark Davies on davies.family@xtra.co.nz with expressions of interest. A weekend experiencing Cascade Kauri Park in the Waitakere Rangers Regional Park. The programme includes volunteer activites with local Forest & Bird members, a variety of scenic bush walks, presentation by Ark in the Park and listening to the early morning dawn chorus. Accommodation: Karanga Camp, adjacent to Cascades Kauri Park. Cost for 2 nights accommodation and all meals is $55.00 (assuming that we have an average of 20 people staying each night). Email Mary Mozingo on monzingo@ihug.co.nz with expressions of interest. Dr King has been researching animal pest trapping methods. A PhD student who has just completed research on rats and mice in Pureora Forest and will talk about the results of this study. This is a great opportunity if you are down at Pukawa Bay/Lake Taupo over the long weekend or live in the Taupo area. Check out the Event Calendar on our website so you can find out about members’ field trips and volunteers activities so you can plan to be involved in all our upcoming events.